While these questions may seem daunting, there is also something rather exciting about the fact that there are so many possible answers to them. Really, this wide range allows enough space for each artist to have the opportunity to approach live electronic performance in whatever way they think best suits their own personal artistic goals – to decide where along the spectrum of approaches they are comfortable, what resources they put to use, and how they’ll balance the array of performative and technical factors that go into live electronic music. 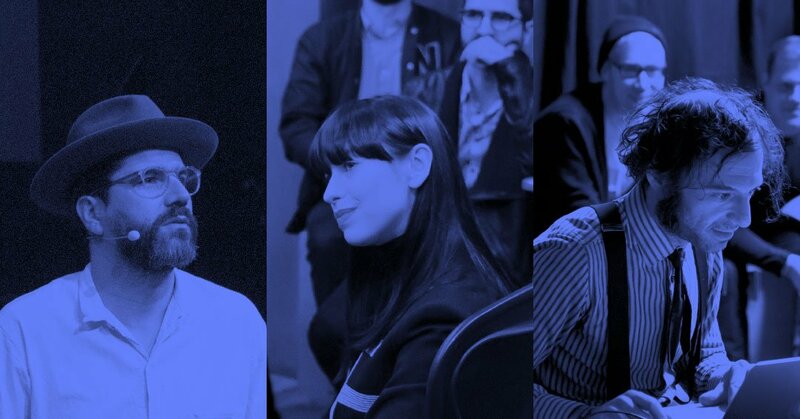 The ongoing discussion around the evolution of live electronic performance is at the root of what Ableton has always been about (it's right there in the name: Ableton Live), which is why at our most recent Loop Summit in Berlin, we gathered three accomplished artists from across the musical spectrum – Monome master Daedelus, experimental pop auteur Kimbra, and musical globetrotter Quantic – to speak about their individual approaches to live performance. Below are some of the key takeaways and clips from their illuminating panel discussion. Again, considering that there are so many potential individual ways to approach live electronic performance (not to mention the many pieces of gear and configurations available to help accomplish the task), our three Loop panelists stressed the importance of imposing limitations early on. Especially for those just at the beginning stages of taking their studio creations to the stage, considering where to limit the parameters of one's approach can help make what seems like an almost unanswerable question (that of 'Where do I even begin?') down to a more reasonable size. Limitations can take many forms. There are the more obvious limitations like the equipment available within one's budget, the amount of processing power of one's CPU, and even more innate limitations like the fact that a single performer only has two hands, two feet, and 10 fingers. Still, when crafting a live set, the panel agreed that defining certain aesthetic and logistical limitations can help free a performer to actually, well, perform during the course of a set. In other words, by relieving oneself of the responsibility to personally direct and oversee every single detail of a song during a performance, you can free yourself to make more creative decisions in the moment – hopefully, decisions that the audience will be able to recognize and hear in real time. During the discussion at Loop, both Daedelus and Kimbra emphasized how mapping out clear and consistent limitations across songs are key to setting up a live rig that allows you to confidently manage a system and still stay present in a performance; to find a balance between technological control while leaving space for artistic expression. Quantic offered similar advice, saying that for beginners he believed that "Less is more," and that, in terms of gear limitations, artists should realize that searching for a perfect unit that will do absolutely everything you need in a live set is often a dead end. "One thing I learned over the years is not to be an idealist," he explained. "There are a lot of people I feel like can get stuck in the 'I need the perfect thing for this,' [convinced] that there must be something out there that does exactly what you want to do… but there's never anything [like that]. Technologically speaking, I haven't found anything that totally is the Swiss army knife kind of answer." Recognizing the necessity of limitations means, however, that one must also recognize there are bound to be compromises as a result. Let's be honest, you (likely) can't bring your entire home studio out onto stage, or if you did, it’s still very hard to stay on top of every single aspect of the performance all by yourself. All of which means that there is a tradeoff to be made: the more pre-programmed pieces you use in a live set, the less room there is for in-the-moment creative decisions; but if you leave everything to in-the-moment creativity, your song may take too long to come to life or even be unrecognizable from its studio equivalent (which, admittedly, isn't necessarily always a bad thing). "[You want] to have… the comfortability of creativity, but then be able to basically make it be instantaneous, which is tricky," Daedelus surmised of this trade-off. "In a lot of ways, people want maybe the studio results," he continued, "But I think the live situation implies that it's going to be different and change and I think embracing that opportunity to have something new occur.... [is] a good space to work from." At another point in the Loop discussion, Daedelus gave some further insight into how he first approached the task of finding this balance in the early versions of his live set. Kimbra explained that, for her, where an artist decides to land on this trade-off can vary depending on the circumstances. "There are sort of two set-ups that I have that allow for me to have different levels of freedom," she explained. "Obviously playing a festival like Coachella, you don't want things falling too out of time when you are there to, you know, get the party started... But then in the more intimate set-ups I like to take the audience on a bit more of journey of watching the song build from the ground and even engage them in the danger of things being on the brink of collapse at times, which I think for all of us is kind of the joy of music making, is that things can go wrong and that's kind of the excitement when they go right." The New Zealand artist circled back to the idea a little later on, saying "It's about humanity…I like feeling that things could collapse and I like feeling danger in performances." Quantic echoed similar sentiments, mentioning that early on in his live set-ups he would bring a certain tape delay or piece of rack gear he had used in the studio on tour with him because he felt "That's what the fans needed," but at a certain point it became impractical. "I think in the end it's about simplification, but [still] retaining the vibe [of the song]." Later on, Quantic discussed the freedom he allows himself and his group by not being so strictly tied to the recorded material. "The ability to go off the road map too, to tangent and just be like that looks nice we're just going to go there, that's really important. Having the ability to stay on schedule but just also tangent." For Daedelus, the introduction of chance operation and a willingness to constantly reinvent tracks is the key to keeping performances fresh and exciting. Physicality is one of the hardest things to translate into an electronic performance. In a more traditional band set-up, a drummer plays a drum set, the audience can see the drummer exerting purposeful physical effort and hear the corresponding sounds of the drums being hit. Same goes for guitarists, pianists, horn players, etc., all who can be seen exerting – and sometimes even exaggerating – physical effort to make the sounds come out of their instruments. But with electronic music, that innate level of physicality is not always present. The need to bring some sort of physicality and recognizable action to an electronic performance was a topic that came up often during the Loop discussion. And while Kimbra's and Quantic's hybrid ensembles help bring some physicality to their performances (not to mention Kimbra's vocal abilities), they have also been forced to find ways to breathe physical life into the electronic side of the equation. "The physicality thing is really important," Quantic stressed. "I know it sounds silly but I would say the choice of the height of your interface or whatever you're playing is almost more important than the interface itself." For her part, Kimbra acknowledged that it was essential during her performances to find moments to step away from her rig of electronics, in order to connect with the audience more directly. Still, she noted that when one is in control of a rig, it is key to feel comfortable and understand exactly what each knob and function does. "You need to feel at home in your set-up," she said. "You need to get on stage, put your hands out, and feel 'Ahhh, okay, now I can be, now I can perform,' and you know when it's not that… It needs to feel like your little lab." On the other end of the spectrum, Daedelus has had to confront this question of physicality from a more purely electronic standpoint. "The truth of that matter is that I think displaying the idea of technique was key to try to get the audience involved," he said. "That is the crux of my particular issue: to make sure both that I am able to engage with the music in a vigorous fashion and that the audience can understand that work and we can get somewhere together. That is the central part of my performance ideal and therefore turning the [Monome] controller forward, just making the repetition of procedure as obvious as possible, is really important." Speaking more generally about electronic performance, Daedelus added, "It really is the kind of thing where... I think it's even better and it's more understood when the gesture does equal action… [when] it communicates to the audience that the gesture is the sound." Of course, no 70-minute discussion on electronic performance is going to cover every single aspect of the topic, but it is telling that among these three artists – who have worked for many years on developing and road testing their live shows – that these are the points of focus which arose. Of course, there were some gems of wisdom in between: Kimbra warned others to "Never drink alcohol before you loop" before telling a story about messing up a performance on Jay Leno's television show; and on a somewhat related note Quantic advised that live performers should, "Be prepared to have beer spilt on anything," and that "You have to have a backup plan," for when things go wrong. To close things out, in reply to the all-important question of how to measure the success of a performance, Daedelus landed the thought that seemed to best sum up what all electronic performance thought and preparation should lead to: "The performance should be as fun as possible," he explained. "The work aspect – all the thinking and stuff – you can do that at any time and it can make your life a lot easier to have that fun… Everything you do that you have fun doing, the audience is probably also going to have fun."